Hey, did you notice my new tab up there ^^? The MALLORCA FAVORITES – It’s new! Soon to list all my favorite things here on the island. Eat, See, Go, Do, Get ~ MALLORCA. I have been living here for over four years now and that is long enough to tell you where to be and how to do it. So check it out. A favorite place of mine to eat at is Viena in Cas Concos. A small town located in the southeast of the island. The owner is a bit kooky, the food is always excellent and the time spent there is always memorable. The last time I was there the owner showed us pictures from his digital camera; his boots, his socks, and a dead mouse. 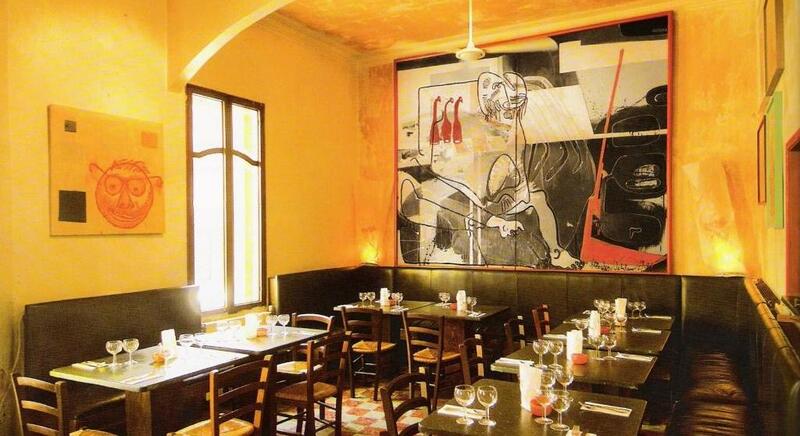 And check out the paintings in the restaurant, modern yet odd. The menu can change slightly from time to time but the tried and true always stay the same. For starters (which are tapas), the datiles con bacon and the pimientos de padrón cannot be missed. The goat cheese is excellent too, but very filling. And for your main course, you can never go wrong with the lamb or the duck but the true favorite is the schnitzel. The owner is German and the schnitzel is one of the best I have ever had. Bring your appetite, cuz it is humongous. But don’t worry, they also offer a 1/2 schnitzel which I always take home. And yet, still delicious the next day. 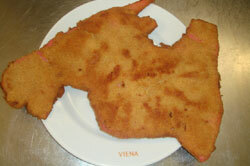 What country is shaped like the featured schnitzel? Kazakstan? Next Post Hello. My name is Kim. And I like cars. I love the pimientos de padron. yum. And I forgot about devils on horseback…. how? btw – did you see Julie & Julia? it hasn’t come to the island yet. but i am ready to cook up a soufflé as soon as i see it.